Coal India fell the most by 2.58 per cent among Sensex scrips, dragging the index into the negative zone. 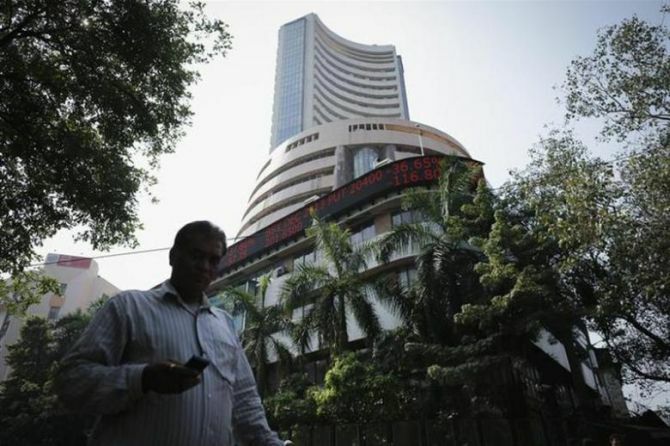 Market benchmark BSE Sensex on Wednesday dropped by 173 points, snapping its two-day record-closing run largely due to losses in key energy stocks of Reliance Industries and Coal India. The 30-share index hit an all-time intra-day high of 38,989.65 at the outset but the market lost steam as investors preferred to book gains after the recent rally. The BSE barometer touched a low of 38,679.57 points towards the fag-end before settling at 38,722.93 points, down by 173.70 points, or 0.45 per cent over the last close. Also, the NSE Nifty index in choppy movements finished lower by 46.60 points or 0.40 per cent at 11,691.90. Intra-day, it hit a high of 11,753.20 and a low of 11,678.85. The Nifty had risen by 181.40 points or 1.54 per cent in the past two days. Reliance Industries snapped its seven-day winning run to close down by 1.8 per cent even as its daily trading volume soared 1.5 times to 5.71 lakh against two-week average of 3.78 lakh. Infosys, HDFC Bank, Yes Bank and IndusInd Bank also declined due to profit booking. The rupee plunged to a record low of 70.57 (intra-day) to the dollar, largely on strong month-end demand from importers and banks amid weakness in other Asian currencies. "Market gave up some gains due to a weak rupee and profit booking ahead of F&O expiry tomorrow," Vinod Nair, Head of Research, Geojit Financial Services Ltd said. Sentiment also took a hit after rating agency Moody's Investors Service said there are risks of India breaching the 3.3 per cent fiscal deficit target for the current financial year as higher oil prices will add to short-term fiscal pressures, brokers said. PowerGrid, NTPC, Asian Paint, Vedanta, HUL, Axis Bank, Maruti Suzuki, Adani Ports, Bharti Airtel, L&T, HDFC and Sun Pharma lost up to 1.58 per cent. In contrast, ONGC emerged top gainer by surging the most 1.58 per cent, while SBI rose 1.54 per cent. Tata Steel, ICICI Bank, Tata Motors, ITC Ltd, Wipro, M&M, Kotak Bank, Hero MotoCorp and Bajaj Auto too ended higher. Sectorally, the BSE energy emerged as the worst performer, sliding 1.13 per cent, followed by telecom (0.71 per cent), teck (0.50 per cent), IT (0.41 per cent), healthcare (0.38 per cent), capital goods (0.15 per cent), consumer durables (0.14 per cent), FMCG (0.13 per cent) and banking (0.09 per cent). Metal, realty, PSU, oil&gas, infrastructure and auto indices ended in the positive zone, rising up to 1.11 per cent. The broader markets outperformed benchmarks as the mid-cap index rose 0.47 per cent and small-caps gained 0.05 per cent. Shares of JSW Steel climbed 8.97 per cent to hit 52-week high following announcement of its entry in NSE Nifty 50 from September 28. Market breadth was negative as 1,429 scrips declined, 1,281 scrips advanced and 166 remain unchanged. Globally, Asian stocks ended mixed as investors were cautious as they await developments in the China-US trade row. Key benchmark indices Shanghai Composite Index fell 0.31 per cent, while Singapore down 0.17 per cent. Japan's Nikkei rose 0.18 per cent and Hong Kong's Hang Seng gained 0.14 per cent. European markets were trading narrowly lower as key indices Frankfurt's DAX and Paris CAC 40 moved down by 0.01 per cent and 0.2 per cent. London's FTSE too turned negative by falling 0.43 per cent in late morning trade.